Much rarer than the other first-year-of-release poster released after the Oscars. Bob Peaks US artwork reworked by Brian Bysouth for the UK market. Actual poster size is 30 x 40 inches (32 x 42 including the line-backing). Brian Bysouth (from Bob Peak's US artwork). Numerous pin holes on edges but otherwise in fantastic condition. 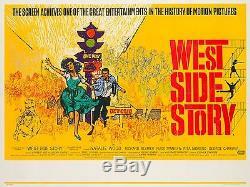 The item "Original West Side Story, UK Quad, Film/Movie Poster 1961" is in sale since Tuesday, April 4, 2017. This item is in the category "DVDs, Films & TV\Film Memorabilia\Posters\Originals - UK Quads\Pre-1970". The seller is "orsonandwelles" and is located in Bath. This item can be shipped worldwide.